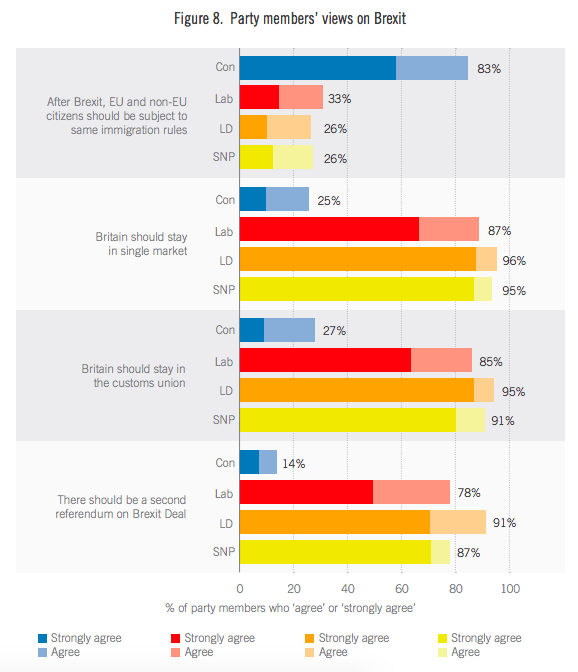 Over three quarters of Labour Party members want a second referendum on any Brexit deal and nearly nine out of ten want to remain in the single market, new research shows today. 87 per cent of Labour Party members said Britain should remain in the single market after Brexit. 85 per cent of respondents said Britain should remain in the customs union. 78 per cent said there should be a second referendum on any Brexit deal. The research, conducted last June, also looked at the views of members of the Conservatives, Liberal Democrats and the SNP. Whilst Labour members shared broadly similar views on Brexit to members of the SNP and Liberal Democrats, opinions in the Tory grass roots differed greatly. Only 25 per cent of Conservative Party members believed Britain should stay in the single market after Brexit; 27 per cent thought Britain should remain in the customs union; and only 14 per cent wanted a second referendum on the Brexit deal. The polling also looked at attitudes of party members to other issues. The full report can be read here.